Also, Draw A Bird Day (the August reprise) is coming up this Saturday, the 8th. Not sure if anyone is still interested in keeping the monthly bird celebration rolling, but birds are fun, so … I will if you will. Happy Sunday, and just think: the fall foliage will be showing itself before we know it! Well, in the Northern Hemisphere anyway. I should probably try and learn how to paint trees, so I’ll be ready! Sending peace to you and yours this weekend. Enjoy! I love the way the leaves merge and emerge from the ground. I can’t decide about the rose, should it have been more prominent or just as shadowy? No matter, it’s got a nice feeling. Haha – this looks just like half the watercolours I ever try – just looking at it my mind is telling me off for not waiting a few more minutes to add more colour 🙂 it’s a cool effect if you’re ever intentionally trying to achieve it though! Yeah it’s almost like I should call it “Roses in the Fog” or something lol. That’s a nice, soft image. I like that you are experiment with color so much these days. I’m still on for draw a bird day–it’s on my calendar. Yay! Looking forward to it, Evan! Awesome, Teresa! :)))) it’s always fun to draw birds. Yes, it is! I look forward to yours! Thanks Teresa, same goes for yours too! Bird and squirrel could be cute combo too lol!! Thanks, Carmel! I’m working on roses. Don’t seem to make too much progress, but they’re a favorite, so I’ll press on! Beautiful rose bud Laura – it has the softness that shows the elegance that’s waiting to burst open. You’ll love painting trees – can’t wait for your autumn series. Oh thank you, Mary! Boy if I could ever do a tree in WC as brilliantly as you do in OP, now THAT would be something. Thank you again for the praise. I’ll keep working on roses; I do love them. I actually finished an underpainting yesterday for a close-up of a rose – not the easiest of flowers for me to paint, so we’ll see where this ends up. Thank you for your kind comment. Based on what you have already tackled and succeeded, I have a feeling that you’ll have no problems painting trees. I’m enjoying your flower series – have a wonderful Sunday! Thank you so much Mary, and I wish you the same! Wow, can’t wait to see your rose!! That’ll be an exciting moment for sure!! Aww thank you, Beth! I was actually thinking about maybe turning this into a collage or art quilt, bookmark, something like that. 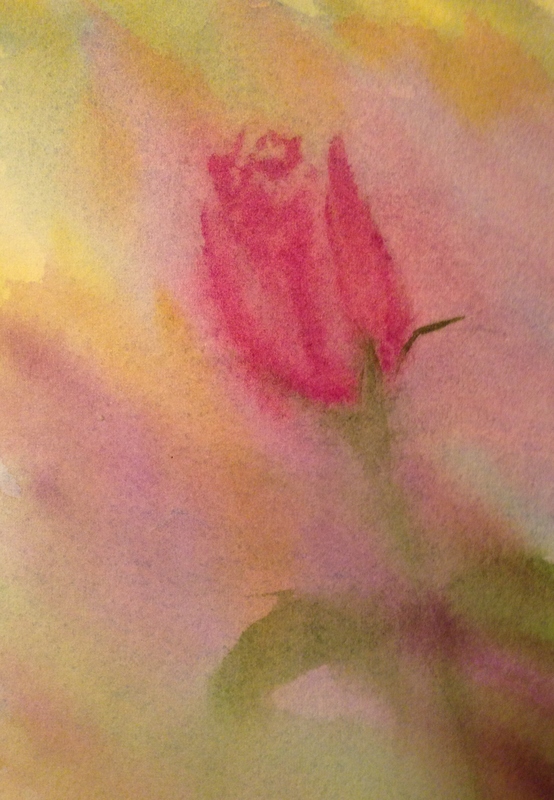 I’m definitely going to be exploring roses further in other paintings though. I think it’d be easier to start with a fresh paper at this point. I should call this London fog :))) I appreciate your feedback! Argh! But great chance to sketch random people lol! Funny, I was thinking the same thing! 😊 Oh, and I was thinking what if you added some color pencils to you rose painting? Just a thought. I’m ready to collage it but that’s a really good suggestion, Jill! Another friend combines the two and gets beautiful results! Laura, it’s lovely as it is, but if the softness bothers you, you can go in now with thicker paint, not much water, and put some hard edges in, and some darks. but it is sweet as it is. You want to learn patience Laura? Come bird with me. LOL !! Love this delicate rendition of a rose. A unique perspective. It’s dreamy, and has a lovely color palette. I really like the creamy background. In photography we call it “Bokeh” It’s a Japanese word that means Blur. I’m a huge fan of Bokeh and isolating the subject. I think you did it very well here. I like it! And I’m determined to actually draw a bird this month – I’ve marked it on my calendar & I should be around to actually do it! Oooh, ha ha! Great idea! I rather like this, a rose seen through a mist. Your color choices blended nicely, also. I also like it that you allowed the water some of its own way with your painting. Good job! Thank you Leslie! Sometimes I give the water too much of its own way lol. :))) I’m glad you enjoyed it!